Excessive bleeding of more than 80 mls of blood (16 soaked sanitary pads per cycle) indicates abnormally heavy bleeding. Also known as "heavy periods". Menorrhagia is excessive menstrual bleeding during the regularly expected menstrual period. Many women experience what they consider may be a “heavy” period when 16 or more soaked sanitary pads in any one cycle is considered menorrhagia. Menstrual blood flow is mostly controlled by the hormones estrogen and progesterone. Estrogen stimulates a build up of the uterine lining and progesterone holds the lining together. 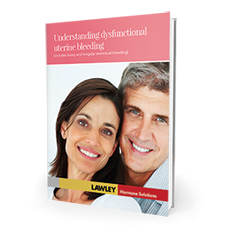 There is a fine balance between the two and if there is a disruption to one or both hormones, often the disruption can be reflected in menstrual bleeding changes. Abnormally heavy or prolonged menstruation. Usually a sign of underlying disorder, such as hormone imbalance, uterine fibroids or, rare, cancer of the uterus. Untreated may cause significant anemia. Most common reason for menorrhagia. Menorrhagia is characterized by abnormally heavy or prolonged menstruation. Variations to the condition include menometrorrhagia means heavy and irregular uterine bleeding during the expected menstrual period and also at irregular, unexpected intervals and metrorrhagia means irregular uterine bleeding between expected menstrual periods. When do I need treatment? What is a normal cycle? What are the signs and symptoms of DUB? How can I decrease my symptoms? How do I prepare for my doctor’s visit? What can I expect when I visit the doctor?